Firefighters battle a blaze at 129 Ridge Rd. in Douglaston, Queens Monday afternoon. QUEENS — A half dozen firefighters were treated for minor injuries after fighting a raging residential fire in Douglaston Monday afternoon, according to the FDNY. The fire broke out on the second floor of a two-story home at 129 Ridge Rd. at around 3:13 p.m., fire officials said. 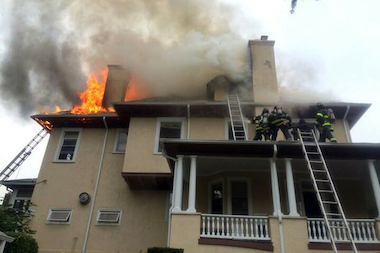 It took the FDNY more than an hour to get the blaze under control. The injured firefighters were taken to North Shore University Hospital and Long Island Jewish Medical Center. The fire was finally brought under control at 4:51 p.m., a fire department spokesman said. No residents were injured in the blaze.